As a participant in this tour you'll fly to Johannesburg, to be met by Blazing Trails staff and transferred to your hotel, where there will be some paperwork to complete and where we will give you a briefing on the trip ahead. The following day we will collect the bikes and head out into deep joy. When riding there will be a lead rider and, if there are more than five riders, a sweeper travelling at the rear. Tour participants will navigate using a 'marker' (also known as a 'buddy') system, whereby the rider behind the leader drops off and waits to guide those coming behind. The riding on this tour is nearly all on tarmac, and despite some nasty potholes in places, this tarmac is generally very good, with little traffic, and makes for super-satisfying riding. We will be taking a few dirt roads on this tour, but never for any distance and they are usually pretty smooth. We would certainly not describe any of the rides as 'off-roading'. Fly from the UK to Johannesburg International Airport, to arrive the following morning. Arrive in Johannesburg, to be transferred to your nearby hotel where the Blazing Trails staff will meet you and brief you on the adventure ahead. You will be introduced to your bike, before we will doubtless head off to a bar. The hotel is situated in a lively locality, with lots of bars and restaurants from which to choose. We mount up leaving the city behind. The easterly ride out of town is initially a long, straight one, until we leave the motorway and head along a lesser road to take lunch in the charming little town of Dulstrom. From here, there is more sweeping countryside until the seriously, seriously, almost unspeakably good riding begins over the Long Tom Pass and down to Sabie. Another delicious 30km sees us at Graskop and our smart hotel. There are a number of restaurants to chose from for dinner and a fun biker bar. Another riding day to die for. 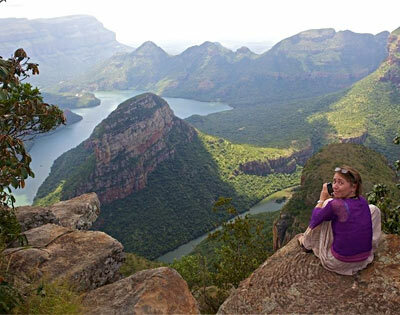 We quit Graskop and after a few kilometres stop off to take in the views at God's Window, a viewpoint over a spectacular gorge and the forest beyond. Back on the bikes again we're in for more bliss as we wend our ways down the amazing road to the Blyde River Canyon and one of the globe's most amazing geographical views. Next comes more top riding to the Abel Erasmus Pass and down to the Lowveld. We end the day in a smart Hazyview hotel. Top activity (and a bit of a 'must do') after a very early awakening, will be a day's safari in Kruger National Park. This is one of the best places to spot 'The Big Five': elephant, rhinoceros, lion, leopard and buffalo. You are very unlikely to see all of these, but there is always plenty of game to view. Another day; another country. From Hazyview we will ride through Lowveld country and into the old gold-rush town of Barberton. We will now begin our ascent to the Kingdom of Swaziland, climbing via one of the best rides imaginable. After border formalities, we'll start towards the Swazi town of Piggs Peak. Appropriately enough, the road turns to pigshit for the first 25km, after which it is superbly surfaced and super-fun. We'll spend the night at Maguga Dam, in smart huts looking out over a reservoir. This long ride begins in the heights of Swaziland and ends on the Indian Ocean. We begin by finding our way to the South African border at Sandlane and dropping down the twisties to Amsterdam. From here we'll use a combination of back roads and highways to make our way through KwaZulu Natal and down to the coast. St Lucia is a small and thriving resort, with plenty of bars and restaurants from which to choose. There are a number of activities on offer here, including boat rides out to view crocodiles and hippos in the estuary, off-shore fishing and jeep trips into the beautiful St Lucia Wetland National Park, a World Heritage Site. Day trips can be arranged that include, game viewing, snorkeling, beach barbeques, or any combination of the above. For the less energetic there is an interesting Crocodile Centre on the park's edge. A long, coastal N2 highway haul carries us 300km south. With the Indian Ocean to our left we will cruise under huge African skies, sweeping past Zulu towns on wide, smooth roads. At Port Shepstone the N2 heads inland – and so do we, snaking into hill country. Leaving the highway we climb up through the Oribi Gorge Nature reserve, amid forest and waterfalls, to our colonial-style hotel. The day ends relaxing in the beautiful gardens with a drink and dinner. Another day; another super South African ride. We will wind back down through the Gorge and meet with the Indian Ocean at Port Shepstone. From here we follow the coast to Port Edward and head back inland on one of the best roads you will find anywhere – super-twisty, great tarmac, awesome views. The ocean again breaks into view as we descend towards Port St Johns, where we will be spending the night by a beautiful estuary. The ride begins away from St Johns carries us away from the coast and back to the sweeping N2 highway, heading north. We will leave the highway around midday and soon we're weaving though beautiful countryside to Pietermaritzburg and on to a charming little farm near Howick. Here we will braai (barbecue) up a feast. Another fabulous day's riding carries us through the lesser roads of KwaZulu Natal, through lovely scenery all the way. In the very heart of Zulu Land, are the battlefields of Isandlwana and Rorke's Drift (as depicted in the film Zulu). We will visit the latter in the afternoon, before heading back to our farm-stay. Another fabulous half-day's riding carries us through the lesser roads of KwaZulu Natal, through lovely scenery all the way. Towards the end of the ride we'll be heading up again and into the Royal Natal National Park and, if the weather's clear, we'll be able to see The Drakensburg Amphitheatre, a spectacular wall of rock some 5km wide and over 1000m high. Our cottages on the edge of a nature reserve, have awe-inspiring views over the surrounding countryside, plus a great bar and restaurant. Our last day on the road starts out as a belter, as we scale a pass and enter the Golden Gate Highlands National Park. Carving through incredible rock formations it is possible to see large herds of game grazing at the roadside. Later we join the highway to begin the long, straight cruise back to Johannesburg. 'Your' beloved bike must be checked back in, before heading to your hotel near the airport. It's a lively area, so there are plenty of options for a tasty last night dinner together. In the morning there's the chance to join a tour into central Johannesburg, to view the vibrant goings on in this very African city centre. Later it's taxis to the airport and off ye go, heads and cameras full of great memories. Tickets will be emailed to you on the address provided when booking. You will need a passport and appropriate travel insurance. Currently UK citizens (and those from most countries) will be granted a tourist visa upon arrival. It is, however, your responsibility to check that you can legally enter the country. Most 'western' driving licences are also valid, but please also check your status before travelling. You will need a credit card against which to secure your deposit on the bike. You should be able to get by on around £600 spending money if you don't do a lot of shopping. Cash and travellers' cheques can be changed at the airport and in the larger towns. Cash points are widespread and most vendors accept credit/debit cards. Cash is best for fuel stations as it speeds up what can otherwise be a lengthy process. Depending on what bike you choose and how you ride it, expect to part with £250-£300 for fuel. At the time of year we will be visiting, South Africa should be nice and sunny, but not too hot, even at the coast. Obviously, though, we can't guarantee this and you should be prepared for the possibility of a couple of wet days. If it does rain in the mountains it can be a bit chilly, but not really cold. The maximum temperature is likely to be around 30ºC on the coast; the minimum 8ºC (at night in the mountains, if it has been overcast during the day). We advise riders to consider their kit in terms of layers, so you can adjust to be comfortable during the course of a varied day. Clothing as you would wear on a tour of Europe is perfectly suitable, weather leathers, or textiles. Some kind of waterproofing is a very good idea. Good gear can also prevent a minor spill causing a trip-ruining injury, so we require that you ride with no exposed skin (except your face). While your main luggage will be carried in a support vehicle, you may wish to bring a small rucksack, tank-bag, or tail-pack in which to carry articles you need on the road. Your main bag must be 'soft' and not a suitcase. While we insist those joining us have a full motorcycle licence, and recommend a minimum of a year's riding experience, time in the saddle and miles ridden are of more relevance to an adventure like this. There are some fairly long days in the saddle, up to a maximum of around 450km (280 miles) in a day. We do, though, try to design the tours so you get an easier day, or down day, after a long ride. South Africa is a very clean and hygienic country (we'd say more so than the UK), with clean ablutions in abundance, and safe tap-water, so the chances of getting even a 'holiday tummy' are low. South Africa has a very low incidence of Malaria – virtually unheard of on this route), but we still recommend that you ask your physician for advice on inoculations. If you have any pre-existing medical condition, it is essential that you consult both Blazing Trails and your physician before booking. South African restaurant food will be familiar to those coming from the West. Food is of a high standard and is very good value (especially meat and seafood dishes), being around half the equivalent cost of the UK. One of the world's great wine producers, South Africa is a great place to sample the grape, which is also great value for money. Decent beers (mainly lagers) are available everywhere. As with eating, we do not want to prescribe what non-riding activities you choose to participate in. In many places there are several options, so we will be happy to advise, put you in touch with the right people and let you decide. While South Africa has had some pretty bad press in recent years for violent crime, very little of this nature happens in the tourist areas through which we will be travelling. And, as ever, the media tends to sensationalize the bad and ignore the good. Being guided through the 'right' areas in a group greatly mitigates the chances of encountering unpleasantness. Petty crime – pick-pocketing and theft – happens, as it does in virtually all tourist destinations with a wide gulf between rich and poor. A few simple precautions, like keeping your wallet/docs in an inside pocket and leaving nothing unattended on the bike, should mean a trouble-free tour. Some awesome, awesome road riding meets wildlife safaris and history. It may be twisty, but the roads are generally smooth, with a few exceptions. The road into Swaziland can get messy for 20km, or so. Traffic is generally very light. Great tour for pillions. Mainly smooth roads, but a couple of fairly short rough sections and long days in the saddle. If rest is required, aircon 4X4 support vehicle is available. Accommodation is generally in three-star hotels and guesthouses (which are of a high standard in SA). Food is western-style and cheap with huge portions. A carnivore's paradise, with seafood also plentiful. Included meals: all breakfasts; 1 dinner. Krugar National Park safari; riding the Long Tom Pass, Abel Erazmus Pass, Piggs Peak road, Swaziland vistas, night drive in St Lucia Wetlands Park (World Heritage Site); crocodile and hippo viewing; Oribi Gorge Nature Reserve; road to Port St Johns; Rourke's Drift visit; Drakensberg Mountains; Golden Gate National Park.